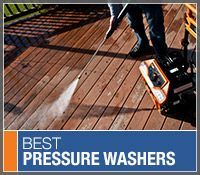 Gas pressure washers are generally much more powerful than electric power washers. The smallest gas pressure washer is more powerful than the largest electric power washer. Likewise, the cheapest gas pressure washer is about the same price as the most expensive electric unit. Gas power washers clean large surface areas like decks, driveways and homes with less time, effort and water. Consumer Pressure Washer Buyer's Guide.. Our Power Equipment Direct how-to library can help you learn about Proposition 65 Product Labeling, Sales Tax Information and Product Recalls for Pressure Washer Equipment.